Talk in the front row at Couture Fashion Week was about how “long” Couture Fashion Week in Paris had become. What used to be a three-day jaunt has been book-ended with new additions to become longer than a week – Miu Miu’s club night kicked things off the saturday before last, and a selected few headed off to Portofino to see Dolce & Gabanna’s Alta Moda show. From a quiet few days of shows, haute couture has been slowly picking up the pace. Whilst it is still a celebration of mastery of hand-led craftsmanship, haute couture week has definitely gotten a lot noisier. But that’s much like the fashion industry in general, and for those that cover shows it has been a non-stop tour from ready-to-wear back in March segueing into the cruise around-the-world tour (Seoul, Palm Springs, Cannes, New York…) and now into an elongated couture that is finally coming to an end. There have been murmurings that spectacle, location and experience has taken precedence over the clothes. The point for brands and houses seems to be to find space and to grab people’s attention outside of the traditional busy ready-to-wear period, which haute couture is primed to do. For the few designers that have eschewed ready-to-wear to show haute couture exclusively, the point is to be free from just making “clothes” that sit on a rack. Tellingly, they also happen to have the luxury of a successful perfume brand to fall back on. “For some time, I have found true fulfilment in working on the haute couture and it allows me to express my creativity and my taste for research and experimentation,” said Jean Paul Gaultier when he announced last year that he would be halting his ready-to-wear to concentrate on haute couture. This season Gaultier regaled us with variations on his signature Breton tops, circular pancake skirts, tall cylindrical hats and then a roaring finale with Anna Cleveland taking to the stage in an intricate shaved ponyskin skirt accompanied by bagpipers from Brittany. Gaultier can of course afford to camp it up as much as he wants with his lines of perfumes and collaborations, as the haute couture stage has become a free-wheeling theatre for him to act out whatever scene and theme he so wishes. Viktor & Rolf also have a solid perfume. In fact, Flowerbomb celebrated its ten-year anniversary on the same day that they presented a collection that is destined for a museum and nowhere else. 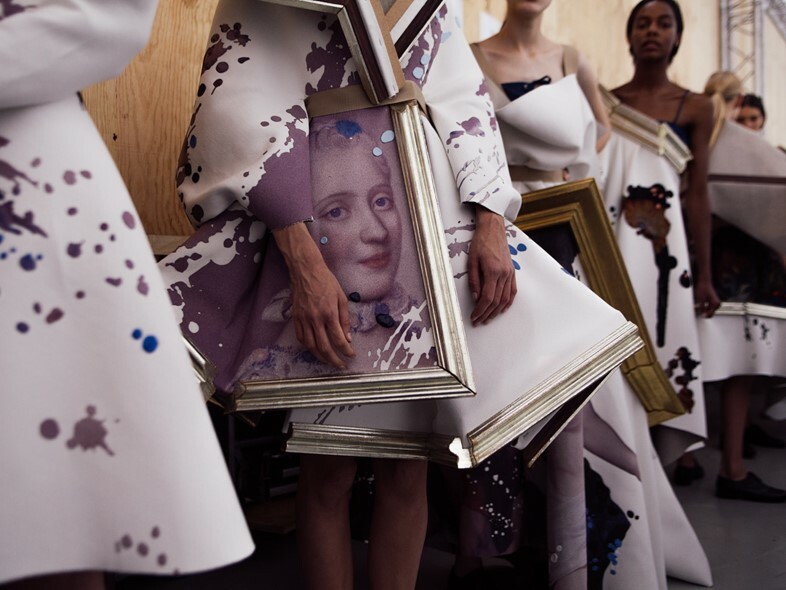 Quite literally, Viktor Horsting and Rolf Snoeren were taking that art-and-fashion comparison head on by creating collapsible painting frames on the body, which they then proceeded to remove to place on the wall as abstracted canvases. Here, the designers were centre stage, acting out a performance as opposed to simply showing a collection. Dutch art comes full circle as these “Wearable Art” pieces with their peeks of the Dutch old masters will wind up sitting in the Museum Boijmans Van Beuningen in Rotterdam as once again, the collection has already been bought by the collector Han Nefkens. Rather than catering to clients, Horsting and Snoeren are intent on a freedom of expression that verges on becoming a vanity project. Client demand is often cited as the primary reason for haute couture’s new additions. Once upon a time, it would have been inconceivable to have the likes of Armani or Versace on the haute couture schedule. Now they’re staunch established “corresponding members” of the Chambre Syndicale de la Haute Couture. And at their shows, the clients ruled the roost as they applauded distressed chiffon frocks and rainbow metallic eveningwear. This time round, we had a new Italian interloper on the HC block as Fendi unofficially closed the week with a debut of their Haute Fourrure collection in the Théâtre des Champs-Élysées. For all the talk of designers using haute couture as a stage, this was a real theatre – which famously debuted Igor Stravinsky’s Rite of Spring. That’s the majestic soundtrack that struck up when the gold-leafed screen rose up to reveal a dramatic Giorgio de Chirico backdrop. What proceeded were the most mind-bogglingly complex and decadent fur coats that meant security was the tightest this writer had ever seen at a show. PETA protesters did show up briefly outside, but couldn’t penetrate this inner sanctum where clients were vying for limited edition croc skin bags, patchworked and embroidered minks and silver dyed sable (a coat estimted by the Financial Times to cost €1m). They were literally yelling out their orders as they went around looking at the furs close-up on the mannequins. 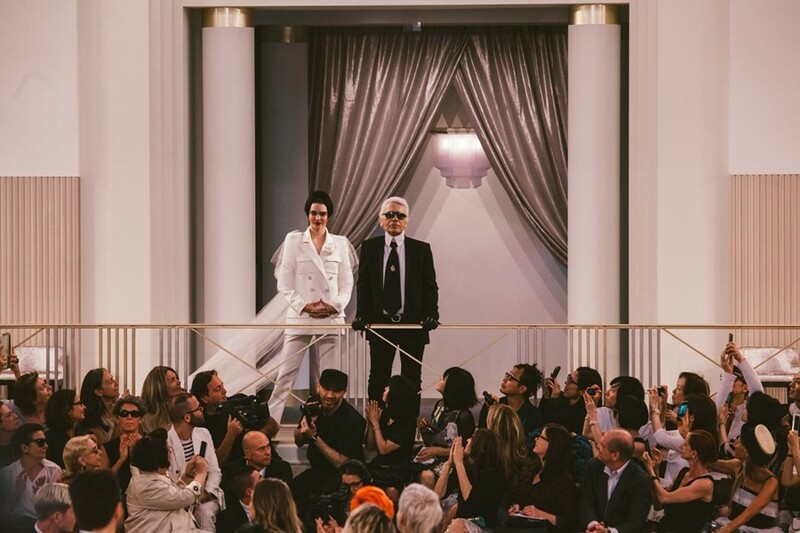 That and the standing ovation that Karl Lagerfeld got was proof that there’s somehow a need for haute fourrure. Another Roman fashion biggie decided that it was time to pay homage to their home city. Valentino decided to stage their latest haute couture show in Rome. But like the location-based experiences that the likes of Dior, Chanel and Louis Vuitton served up for cruise, we weren’t just there to see beautiful clothes. Instead, Maria Grazia Chiuri and Pierpaolo Piccioli were hellbent on showing us the best of their city. We rode golf buggies around town to unearth “secret” locations that included a jaw-droppingly impressive Biblioteca Casanatense and an intimately opulent bathroom. Nestled in these Roman beauties were pieces from Valentino’s past collections, mostly from Chiuri and Piccioli’s seven year tenure. It was a way of seeing these clothes in context. And at the Piazza Mignanelli where the Valentino headquarters are, crowds had gathered up at sunset to see what the fuss was all about, Chiuri and Piccioli’s love letter to Rome built up to a crescendo. Many of the dresses were en nero but there was nothing boring about black when the gowns were accentuated by asymmetric cutting, delicate criss-crossing back straps and Roman motif gold jewellery. Chiuri and Piccioli never go heavy handed. Even though we were experiencing Rome through their eyes, the collection wasn’t tied exclusively to the city. In the audience, clients from all over the world were present. Didier Grumbach, former president of the Chambre Syndicale, once observed that couture clients were in their hundreds in the 1960s and now they were in their thousands thanks to clients from the Middle East and China. That debunks the myth that haute couture is a “dying” industry. Haute couture today has become a playground for designers precisely because that global customer base, who can afford to indulge in a designer’s most extravagant of visions, has grown that much bigger. And so the haute couture stage becomes ever more enticing for the designer to create as they wish.